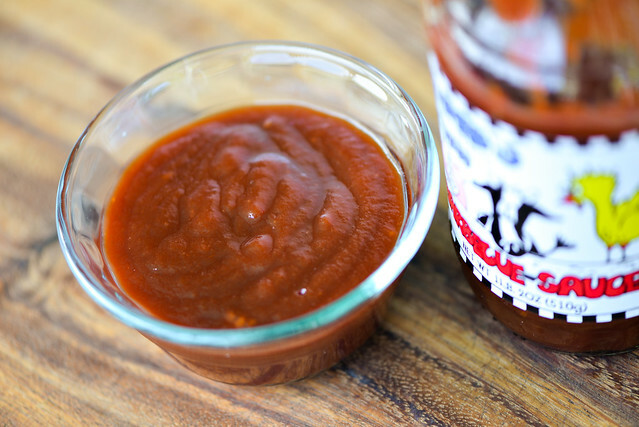 A pleasing heat is delivered against a nicely balanced mix of sweet, fruity, fresh, and tangy to make this sauce a decent choice for barbecue, even if it's not quite worthy of being sought out. Over an inaugural trip to Vermont this past summer, I became enchanted by all the fresh, locally made food stuffs available and went a little crazy buying items to bring back to New York. Among the spoils that included beers, syrups, and handpicked fruit, was this bottle of Richard's Hottest Barbecue Sauce. 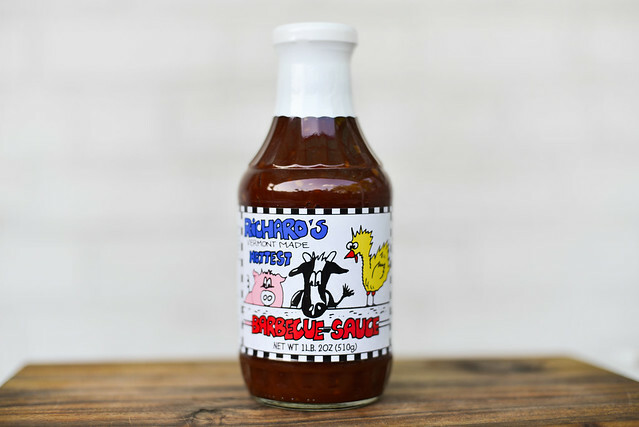 This sauce is cooked up by Richard's Vermont Made, a company owned by Steve and Martha Rocheleau in Saint Albans, Vermont. The sauce was first invented by Martha's brother and father, both named Richard, over 20 years ago. 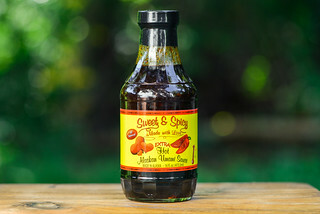 In the late 90s, the sauces had started to garner some awards, and then in 2002, Steve and Martha bought the business and expanded the line which now includes three barbecue sauces along with marinades, hot sauces, and a pasta sauce. The first whiff doesn't hint much at heat, but instead delivers a strong tomato fruitiness with an equally heavy amount of molasses by way of brown sugar. There's a mild vinegar tanginess and Worcestershire undertone in there. If you smell really hard, there's a little heat to be discerned, but it's certainly not a major player in the aroma department. This maroon, opaque sauce has a thickness just north of the medium mark. There's a slight texture to the sauce, including bits of what I'm guessing are garlic or onion, or both. There aren't a lot of spices to be seen, just some tiny specs of red pepper. 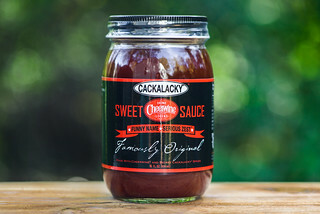 The sauce has a chunky pour off a suspended spoon, falling fast at first, then slowing down to a few final drops, and ending with a heavy portion of sauce left clinging to the silverware. A candy sweet start to the sauce is confusing when considering that "Hottest" is printed right on the label. Sure enough though, that sugary beginning gives way to a mild heat that continues to pick up intensity as the sauce settles on the tongue. Right after that first hit of sweetness, the fresh and bright tomato flavor comes in, mixing with a mild tang and a detectable Worcestershire depth. Bits of onion give some texture and crunch here and there. All of these flavors retreat though just as the sauce leaves the tongue, which is when the spiciness really picks up. Neutral cayenne pepper gives the sauce its heat, which tingles the tongue and lips, but never really sets the mouth on fire. The sauce coated the chicken well, albeit unevenly, but never baked down, leading to it almost completely burning off over direct heat. A final brushing was required to bring the sauce back to an acceptable level before tasting. After being cooked, the sauce had a very nice balance between sweet and heat, with a mild tang. It was simple and fresh tasting, nothing wowing, but certainly pleasing. While in Vermont, I came across so many homemade goodies that had an apparent freshness that's not as common in New York City. I assumed this sauce would follow in those footsteps, and while the sauce had a nice uncomplicated flavor, it didn't really discern itself from most other sauces in terms of delivering a brighter, fresher flavor. 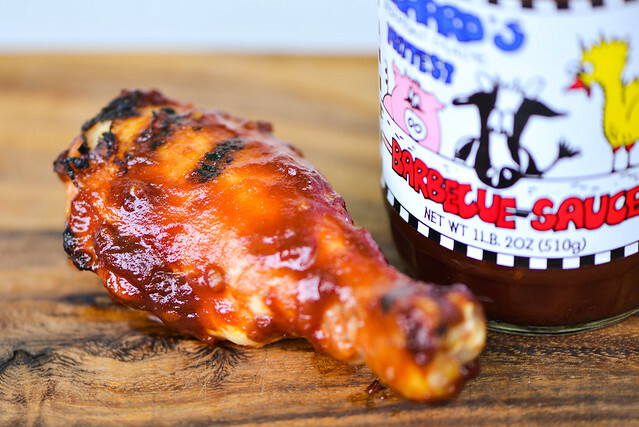 It hit the sweet, spicy, fruity, and tangy barbecue sauce notes with nice balance, and delivered a heat that tingled the mouth and lips, but would be tolerable by most. 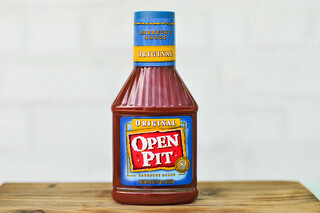 With the exception of burn off on the grill, there was nothing really wrong with this sauce—it was another above average sauce that would serve you well on a variety of meats or veggies and I would certainly pick it up over most supermarket sauces, I just wouldn't seek out.